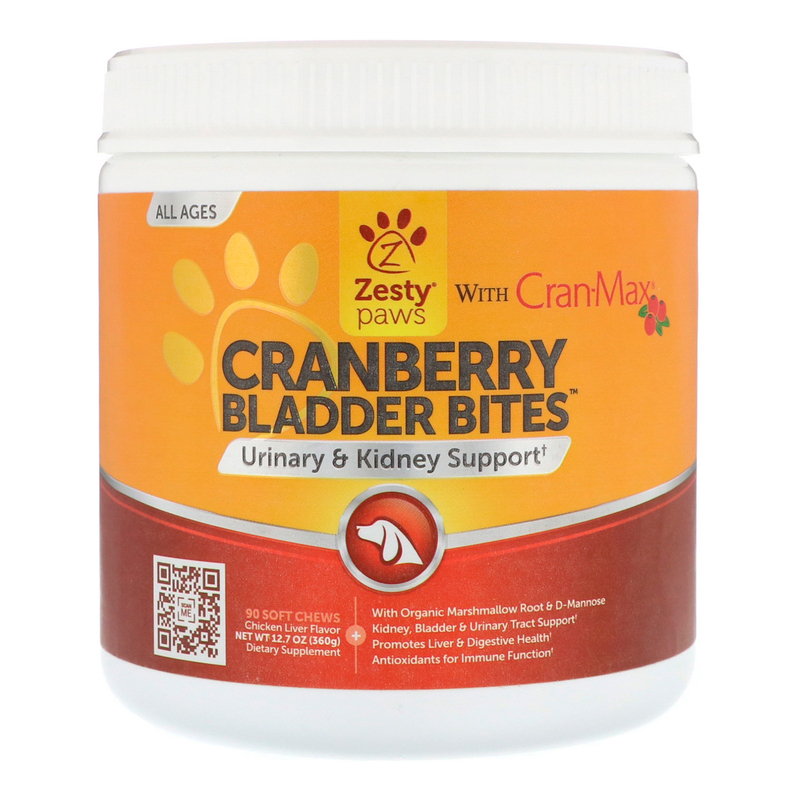 Zesty Paws Cranberry Bladder Bites are delicious chicken liver-flavored soft chews that feature Cran-Max Cranberry concentrate and a blend of nutritive ingredients that support the kidneys, bladder, and urinary tract. Cran-Max: Formulated with patented Bio-Shield technology, this pure Cranberry concentrate is clinically proven to flush out bad bacteria to promote a healthy bladder and urinary tract. Organic Marshmallow Root: Helps flush mineral and toxin buildups from the kidney and bladder to soothe the urinary tract for comfortable urination. D-Mannose: Derived from birch bark (not from corn), this ingredient has been shown to defend the lining of the urinary tract from bad bacteria. 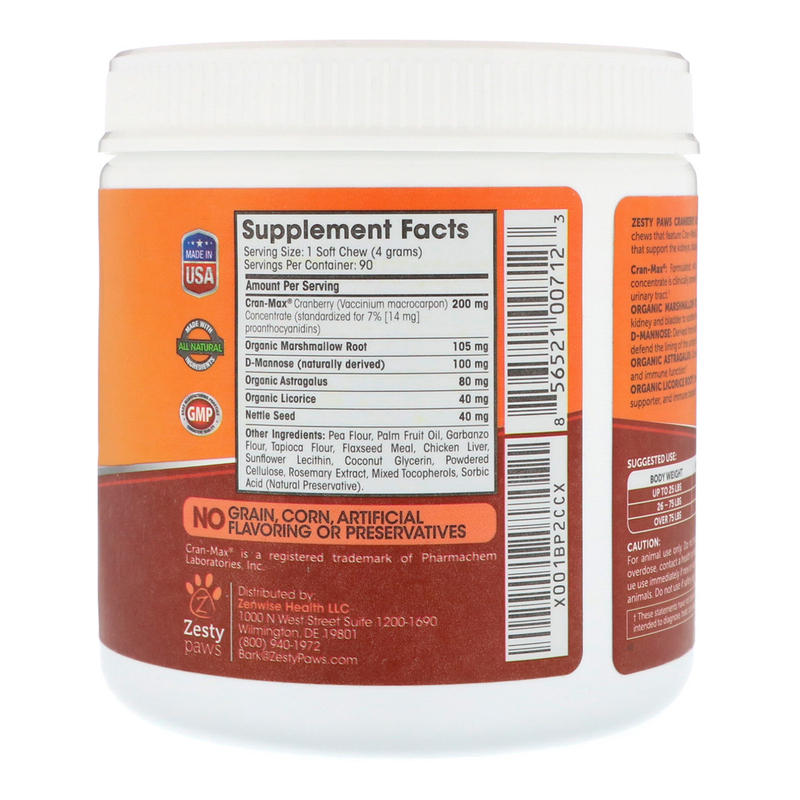 Organic Astragalus: Contains antibacterial properties that support healthy kidney and immune function. Organic Licorice Root: Shown to function as an effective kidney detoxifier, digestive supporter, and immune booster. 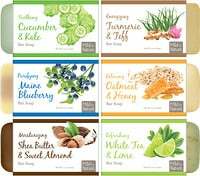 Peas flour, palm fruit oil, garbanzo flour, tapioca flour, flaxseed meal, chicken liver, sunflower lecithin, coconut glycerin, powdered cellulose, rosemary extract, mixed tocopherols, sorbic acid (natural preservative). No grain, corn, artificial flavoring or preservatives. Caution: For animal use only. Do not exceed the recommended dose. In the case of accidental overdose, contact a health professional or veterinary professional immediately. Discontinue use immediately if new or worsening symptoms occur. Keep out of reach of children and animals. Do not use if safety seal is broken or missing.